Earlier this week, on an overcast and drizzly day, I decided to take my camera for a walk and snap some pictures. I figured that because it was a grey day, I'd experiment with the monochrome setting on my Canon so that the images would hopefully capture what the day felt and looked like to me. And just for the record, I have a great affection for grey and rainy days. Most people find them depressing, however, I find them calming, comforting, and cozy. Additionally, I find them visually beautiful and inspiring. I know this sounds odd, but I can take days and days (even weeks) of grey weather. I think I would be a prime candidate to live in a place such as Seattle, where grey and drizzly days are frequent. I've even been told that I would enjoy living in parts of the UK because grey and rainy days are common. Yes, call me strange but I adore grey and Gothic-looking days! 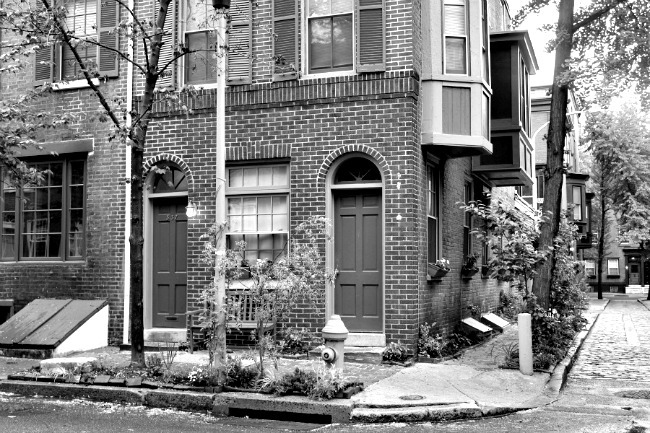 Please allow me to share some images of a beautiful monochrome day in Philadelphia. What gorgeous shots! I find that monochrome photos really bring out the texture and shape of things. Well done and have a great weekend! Some great captures, Ron. I particularly liked the King of Shave! Like you I love to, or rather used to love photographing doors and windows. They are so appealing to me. I used to love walking in the rain, but not so much now. My father used to tell me that one day I would dislike the rain. He was wrong. Even though I love to watch the rain I don't care for getting soaked. Okay, next time we have one of our famous drizzly days I'll send you a free pass to come and enjoy it for yourself. Wow Ron, these photographs are gorgeous! My favorites are the final three. Philadelphia looks like such a beautiful, old city. I love all the brickwork. I like gray, rainy days too. They make me feel peaceful and calm. Ron, your pictures make grey and rainy days look so beautiful and inviting. These images are like monochrome pieces of art! Can you believe all rainy and cooler weather we've been getting? It feels more like fall than spring. By the way, where is the restaurant in #8 located? My husband and I love tapas (and vino)!
" I find that monochrome photos really bring out the texture and shape of things." I love how you said that because it's so true! Thank you :) The King of Shave is located not too far from where I live. I've never gone in for a shave, but should someday treat myself to one!
" Like you I love to, or rather used to love photographing doors and windows. They are so appealing to me." 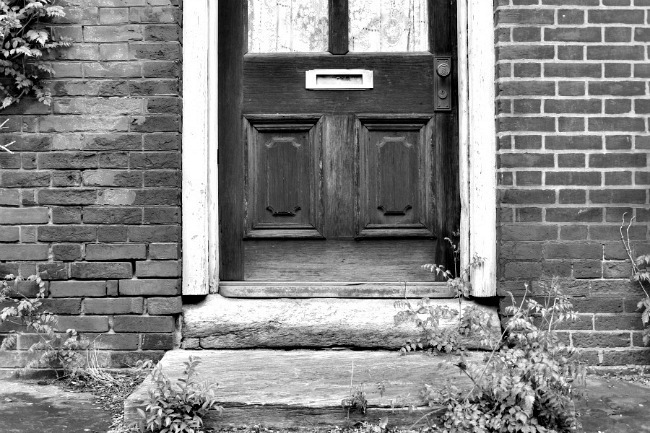 Don't you just love images of doors and windows? And it's funny that you mentioned windows because I will be publishing a post on "window photographs" that I've taken over the past four months. "Okay, next time we have one of our famous drizzly days I'll send you a free pass to come and enjoy it for yourself." Ha! Okay, and I'll be there! Have a super weekend, dear lady. And thanks so much for stopping by! P.S. hope all is better with your eyesight. 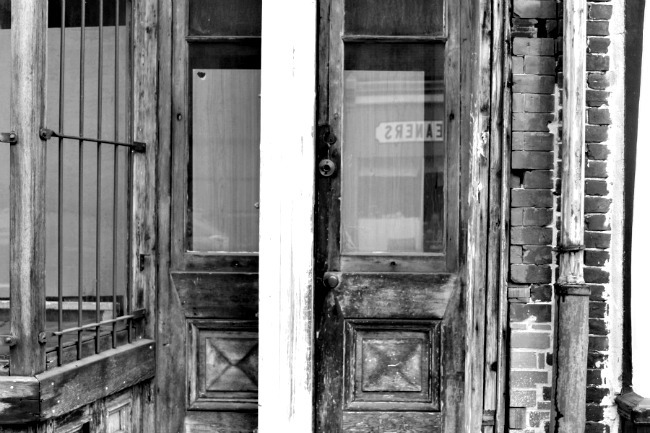 The last two photographs are taken from the same image - the door is the same in both shots.
" Philadelphia looks like such a beautiful, old city. I love all the brickwork." Yes, parts of Philly are very beautiful. It's an old city, do there are some incredible buildings containing some stunning architecture. And yes, can you believe the change in weather over the past week and a half? It went from sunny and very warm, to rainy and colder days. I'm not complaining though because I love this weather. 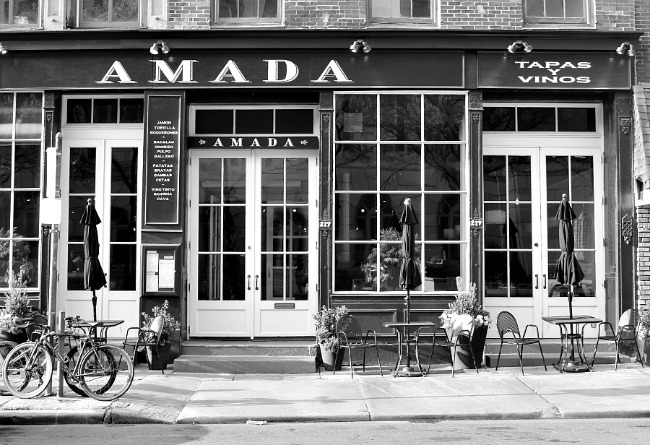 The restaurant Amada is located on Chestnut Street in Old City. I've not eaten there, but I heard it's AWESOME! Have a fantastic weekend, neighbor. And thanks for stopping by! Ron, you *almost* make me enjoy grey days, ha! But, even though your photos are lovely and the detail is fascinating, I guess I'm just a sunshine kind of gal. Something about a string of grey, rainy days that I find rather depressing. Are those slanted things up next to these buildings storm shelters? They look very much like the thing Dorothy tried to get into in the Wizard of Oz when the tornado was coming. I didn't realize Philly had that many tornadoes (though even one can be frightening, right?) Here, most folks gravitate to basements. Just a different architectural style. I remember doing a segment on black-and-white photographs when I was in college, and it was pretty challenging. Despite the change in technology, you've done an amazing job here! Now go and have a wonderful weekend! hey ron, i love looking at your photos of buildings and the designs are just beautiful. nice job experimenting with your camera. they do so much and often times, we stick with one setting and hit click, i'm guilty. keep up the great job, i love looking at your photos! Beautiful selection of photographs, Ron! I love rainy days too, especially when I lived in New York. Here in Florida it rains a lot but it's not the same as the rainy days up north. Like you said, ' I find them calming, comforting, and cozy." I agree! Photo #4 is so beautiful. What a charming little street. Philadelphia is so pretty! I also love #8! I bet the food there is great! Fabulous photographs, Ron! Your ability with the camera keeps getting better and better. It's been so great to see you progress in your passion for photography. You're very talented! I love each of these photographs so it's hard for me to choose favorites. But if I had to I'd say 2, 8, 9 and 10. Thank you for your kind and supportive words :) I am really enjoying this camera because it's teaching me to try new things and experiment. I love taking pictures. Photography has always been something that's held an interest for me. And the more I do it, the more I learn.
" I love rainy days too, especially when I lived in New York. Here in Florida it rains a lot but it's not the same as the rainy days up north. " You're right, the way it rains in Florida is not the same has does here in the North East. Here, it can rain for days. Florida, it rains intensely for an hour (or less) and then it's over. 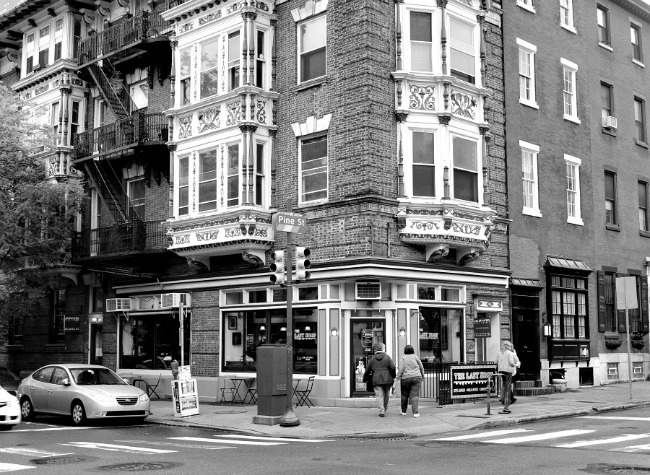 Yes, Philly has a lot of charm in the way it's laid out and in its architecture. I've not ever eaten at Amada but pass by it often.However, I've heard that the food there is FABULOUS! Even from looking at it from the outside, I can tell it's a great place to enjoy tapas and drink some vino!
" they do so much and often times, we stick with one setting and hit click, i'm guilty." Yes, you are so right...I too seem to stick with one setting and hit click. I am so glad I got this camera last year because it's allowed me to step out of my comfort zone and try different settings. I've learned (and am still learning) a lot with this camera. Thanks so much for stopping by and have a faaaaaabulous weekend! Yes, you are absolutely correct...that building IS an Art Deco style! And it's not to far from the area in which I live. 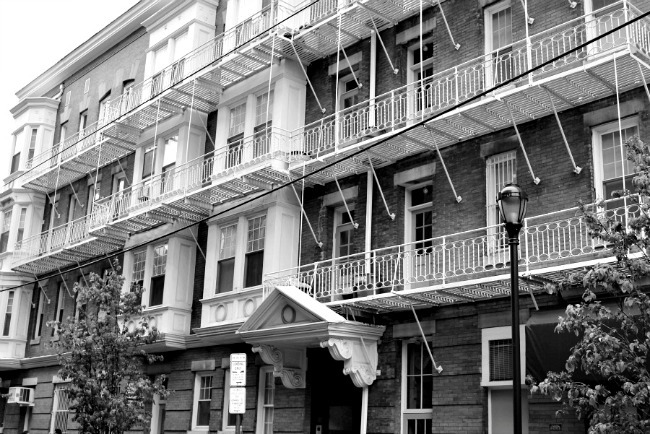 That's the cool thing about the architecture in Philadelphia, it's very diverse. I've not ever eaten at Amada, but need to some day because I LOVE tapas. I also love the way the restaurant looks from the exterior.
" I guess I'm just a sunshine kind of gal. Something about a string of grey, rainy days that I find rather depressing." Yes, MANY people I know feel the same way, so I understand.Yet for me, grey, rainy days feel just the opposite, they give me a feeling of joy and inspiration. "They look very much like the thing Dorothy tried to get into in the Wizard of Oz when the tornado was coming. I didn't realize Philly had that many tornadoes (though even one can be frightening, right?) Here, most folks gravitate to basements. Just a different architectural style." You are so right about that...I too remember seeing a storm cellar door in the movie, The Wizard of Oz! I really don't know why they have so many in Philadelphia because it's not known for tornado's. 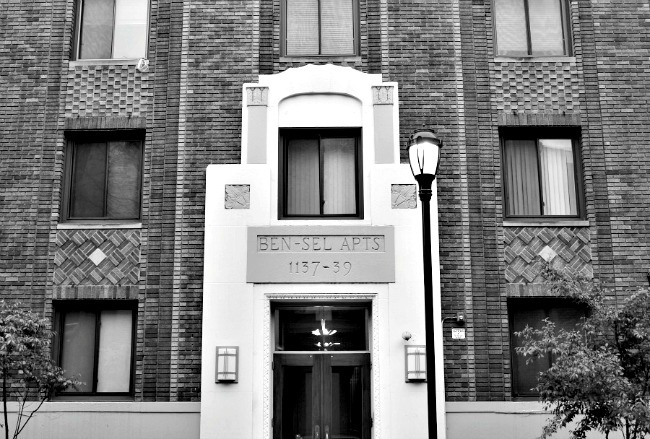 I think it's just part of the old, historical architecture of this city and how homes were built back in the old days, which included exterior basement doors. Also, I think it may have something to do with how things were delivered to the homes back then, they were delivered through the basement door rather than the front door of the house. Thanks so much for stopping by, my friend. Wishing you a faaaaaabulous weekend! Great stuff, Ron! I feel like I walked into the middle of a film noir murder mystery, You find so much beauty in these dark settings. It's different from bright, sunny days, of course, but it's beauty nonetheless. Excellent work, buddy!
" I feel like I walked into the middle of a film noir murder mystery,"
HA! Loved that! You're right, these images do feel like a film noir murder mystery! "You find so much beauty in these dark settings. It's different from bright, sunny days, of course, but it's beauty nonetheless." Thank you for understanding that because I do find beauty in dark settings. And I think that's why I'm attracted to the season of winter, I see such beauty in its grey, barren, and darkness. Have a terrific weekend, buddy. And thanks so much for stopping by! As always, Ron, your photographs ROCK! I looked at each one, noticing all the detail. You make city life like look so interesting and alluring. Photo #10 is my fave! Thank you, buddy. I love city life because there is always something interesting to notice. And I also think that a city backdrop looks even more interesting on grey, drizzly days; especially an old city like Philadelphia. Thanks so much for stopping by and have a SUPER Sunday! You're not odd at all, Ron. I like those grey and drizzly days just as much as you...which is exactly why I live where I do! Great photos, as usual. The monochrome setting really makes some of these pop!
" I like those grey and drizzly days just as much as you...which is exactly why I live where I do!" HA! Mark, I knew that YOU would understand my affection for grey and drizzly days! Anytime I meet a customer visiting my store from your area of the U.S., I always ask them about the weather and if they like it. And they always say, "Yes!" Plus, from the photographs you've shared on your blog over the years, I can that it's also a very beautiful state! Ron, I love these! I forget about black and white. Then maybe once a year I'll remember it and try it out. These need to be in a book, and I really mean it. The bicycle one - that alone is fantastic. I scrolled through but then went back up and looked at each carefully. You can find something new the longer you look. I especially love the people - you are really good at getting shots of strangers! Ron, I don't love grey days, but your pictures I totally enjoyed! You capture the essence of those buildings. Almost like I can see into them--to their soul! The history there must be amazing and IF those buildings could talk--let me just say, I'd like to listen to what they have to say! Bud and Marilyn's looks like such an adorable place. Do they serve coffee? "I love black and white photography. 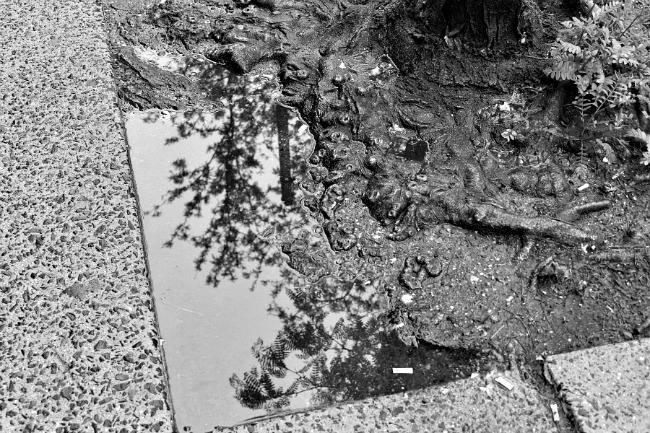 Seems odd, but I see so much more detail in monochrome photos." Lisa, same here. To me, monochrome photographs also have so much "feeling" and "emotion" to them.
" because I do not prefer those gray, drizzly days! All they are good for is watching movies on the couch and napping! :-)"
Ha! Yes, and think most people would agree with you. I'm very much in the minority with my love and affection for grey and rainy days. Thanks so much for stopping by, my friend. Hope you're enjoying a fabulous spring and that all is well! Thanks so much for your sweet and kind words :) I especially enjoy taking photographs of cities because there always seems to be something interesting to notice. Also, I like that city photos usually have people in them. 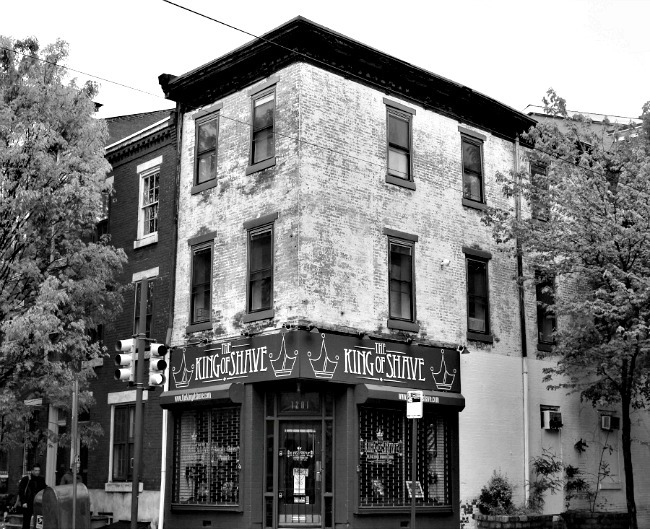 And Philadelphia has so much diversity when it comes to the old architecture, that it's very mood-invoking. I think my favorite city to photograph is New York. It's AMAZING! Ha! I know, most people are like you, they do NOT love grey days. "Almost like I can see into them--to their soul! The history there must be amazing and IF those buildings could talk--let me just say, I'd like to listen to what they have to say!" I LOVE what you shared because I feel the same way about the buildings here, I can FEEL their soul! 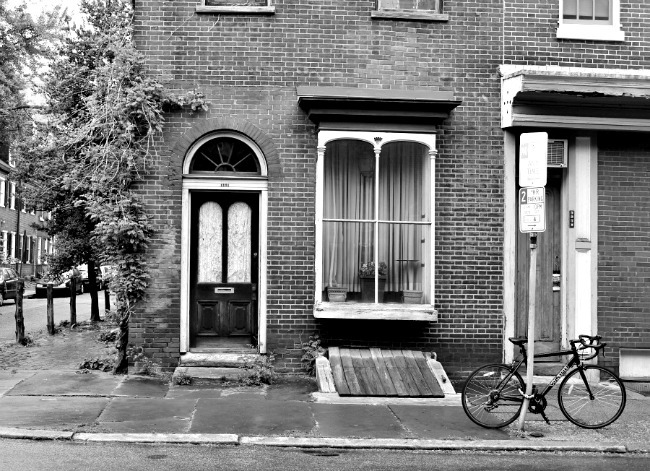 In fact, sometimes when I'm walking down a particular street, I will actually experience deep feelings and emotions about the old homes and locations. Almost as if I can feel their past. 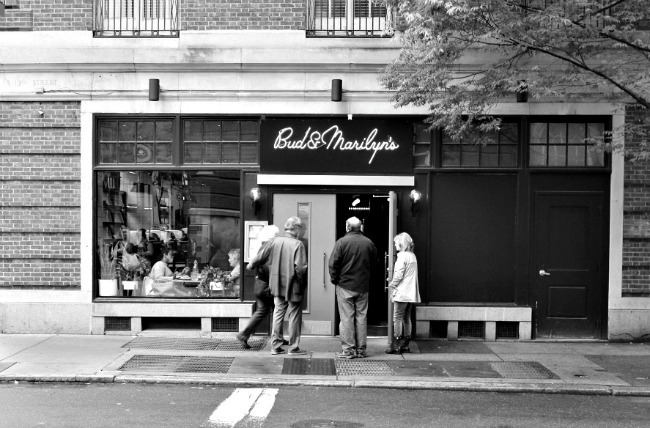 "Bud and Marilyn's looks like such an adorable place. Do they serve coffee?" Isn't that an adorable place? It used to be a gay bar, but then was changed to a neighborhood restaurant last year. They serve lunch and dinner. I haven't eaten there but have heard the food is very good! I LOVE monochrome photos. It allows you to see and feel the truth about a scene, thing, or person. Of course, somethings need to be in color, but B&W has always been my favorite. By the way Ron, these are some fantastic photos! "It allows you to see and feel the truth about a scene, thing, or person. Of course, somethings need to be in color, but B&W has always been my favorite." Pat, I feel the exact same way! Sometimes color IS needed, however black and white will always be my favorite! Thank you :) And thanks so much for stopping by!